Max von Laue, in 1912, discovered that crystalline substances act as three-dimensional diffraction gratings for X-ray wavelengths similar to the spacing of planes in a crystal lattice. X-ray diffraction is now a common technique for the study of crystal structures and atomic spacing. X-ray diffraction is based on constructive interference of monochromatic X-rays and a crystalline sample. These X-rays are generated by a cathode ray tube, filtered to produce monochromatic radiation, collimated to concentrate, and directed toward the sample. The interaction of the incident rays with the sample produces constructive interference (and a diffracted ray) when conditions satisfy Bragg's Law (nλ=2d sin θ). This law relates the wavelength of electromagnetic radiation to the diffraction angle and the lattice spacing in a crystalline sample. These diffracted X-rays are then detected, processed and counted. By scanning the sample through a range of 2θangles, all possible diffraction directions of the lattice should be attained due to the random orientation of the powdered material. Conversion of the diffraction peaks to d-spacings allows identification of the mineral because each mineral has a set of unique d-spacings. Typically, this is achieved by comparison of d-spacings with standard reference patterns. All diffraction methods are based on generation of X-rays in an X-ray tube. These X-rays are directed at the sample, and the diffracted rays are collected. A key component of all diffraction is the angle between the incident and diffracted rays. Powder and single crystal diffraction vary in instrumentation beyond this. X-ray Powder Diffraction (XRD) Instrumentation - How Does It Work? X-ray diffractometers consist of three basic elements: an X-ray tube, a sample holder, and an X-ray detector. X-rays are generated in a cathode ray tube by heating a filament to produce electrons, accelerating the electrons toward a target by applying a voltage, and bombarding the target material with electrons. When electrons have sufficient energy to dislodge inner shell electrons of the target material, characteristic X-ray spectra are produced. These spectra consist of several components, the most common being Kα and Kβ. Kα consists, in part, of Kα1 and Kα2. Kα1 has a slightly shorter wavelength and twice the intensity as Kα2. The specific wavelengths are characteristic of the target material (Cu, Fe, Mo, Cr). Filtering, by foils or crystal monochrometers, is required to produce monochromatic X-rays needed for diffraction. Kα1and Kα2 are sufficiently close in wavelength such that a weighted average of the two is used. Copper is the most common target material for single-crystal diffraction, with CuKα radiation = 1.5418Å. These X-rays are collimated and directed onto the sample. As the sample and detector are rotated, the intensity of the reflected X-rays is recorded. When the geometry of the incident X-rays impinging the sample satisfies the Bragg Equation, constructive interference occurs and a peak in intensity occurs. A detector records and processes this X-ray signal and converts the signal to a count rate which is then output to a device such as a printer or computer monitor. The geometry of an X-ray diffractometer is such that the sample rotates in the path of the collimated X-ray beam at an angle θ while the X-ray detector is mounted on an arm to collect the diffracted X-rays and rotates at an angle of 2θ. The instrument used to maintain the angle and rotate the sample is termed a goniometer. For typical powder patterns, data is collected at 2θ from ~5° to 70°, angles that are preset in the X-ray scan. X-ray powder diffraction is most widely used for the identification of unknown crystalline materials (e.g. minerals, inorganic compounds). Determination of unknown solids is critical to studies in geology, environmental science, material science, engineering and biology. 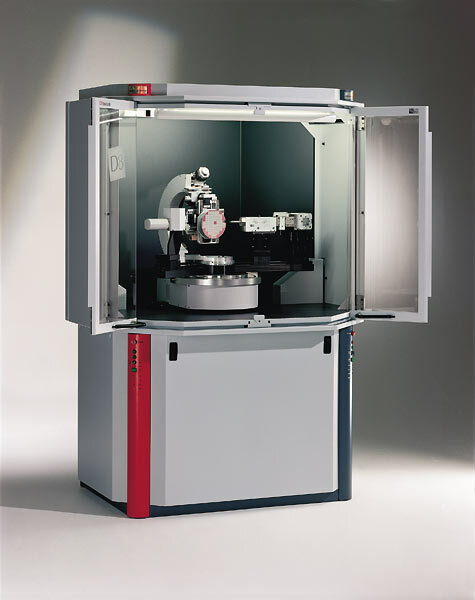 Strengths and Limitations of X-ray Powder Diffraction (XRD)? Determination of an unknown requires: the material, an instrument for grinding, and a sample holder. Care must be taken to create a flat upper surface and to achieve a random distribution of lattice orientations unless creating an oriented smear. 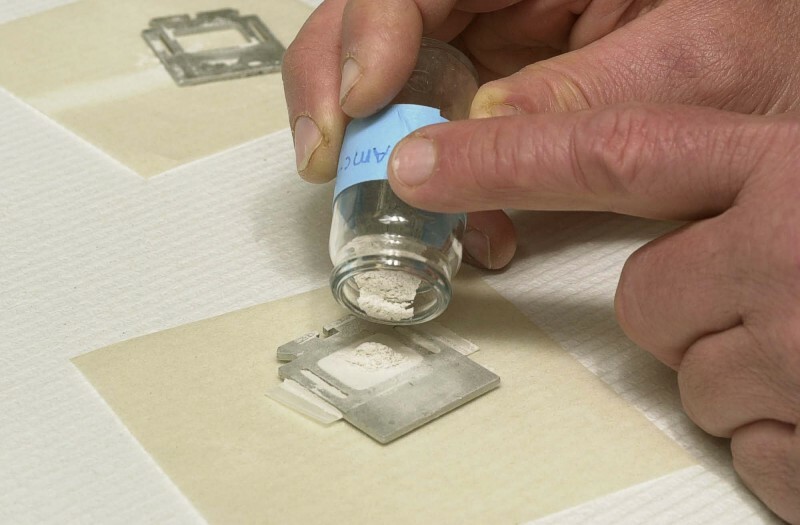 For analysis of clays which require a single orientation, specialized techniques for preparation of clay samples are given by USGS. For unit cell determinations, a small amount of a standard with known peak positions (that do not interfere with the sample) can be added and used to correct peak positions. Data Collection The intensity of diffracted X-rays is continuously recorded as the sample and detector rotate through their respective angles. A peak in intensity occurs when the mineral contains lattice planes with d-spacings appropriate to diffract X-rays at that value of θ. Although each peak consists of two separate reflections (Kα1 and Kα2), at small values of 2θ the peak locations overlap with Kα2 appearing as a hump on the side of Kα1. Greater separation occurs at higher values of θ. Typically these combined peaks are treated as one. The 2λ position of the diffraction peak is typically measured as the center of the peak at 80% peak height. Results are commonly presented as peak positions at 2θ and X-ray counts (intensity) in the form of a table or an x-y plot (shown above). Intensity (I) is either reported as peak height intensity, that intensity above background, or as integrated intensity, the area under the peak. The relative intensity is recorded as the ratio of the peak intensity to that of the most intense peak (relative intensity = I/I1 x 100 ). The d-spacing of each peak is then obtained by solution of the Bragg equation for the appropriate value of λ. Once all d-spacings have been determined, automated search/match routines compare the ds of the unknown to those of known materials. Because each mineral has a unique set of d-spacings, matching these d-spacings provides an identification of the unknown sample. A systematic procedure is used by ordering the d-spacings in terms of their intensity beginning with the most intense peak. Files of d-spacings for hundreds of thousands of inorganic compounds are available from the International Centre for Diffraction Data as the Powder Diffraction File (PDF). Many other sites contain d-spacings of minerals such as the American Mineralogist Crystal Structure Database. Commonly this information is an integral portion of the software that comes with the instrumentation. For determination of unit cell parameters, each reflection must be indexed to a specific hkl. Bish, DL and Post, JE, editors. 1989. Modern Powder Diffraction. Reviews in Mienralogy, v. 20. Mineralogical Society of America. Cullity, B. D. 1978. Elements of X-ray diffraction. 2nd ed. Addison-Wesley, Reading, Mass. For more information about X-ray Powder Diffraction (XRD) follow the links below. Rigaku Journal; an on-line journal that describes and demonstrates a wide range of applications using Xray diffraction. Reciprocal Net--part of the National Science Digital Library. Use the "Learn About" link to find animations of the structures of common molecules (including minerals), crystallography learning resources (tutorials, databases and software), resources on crystallization, and tutorials on symmetry and point groups. Teaching activities, labs, and resources pertaining to X-ray Powder Diffraction (XRD). Weathering of Igneous, Metamorphic, and Sedimentary Rocks in a Semi-Arid Climate - An Engineering Application of Petrology - This problem develops skills in X-ray diffraction analysis as applied to clay mineralogy, reinforces lecture material on the geochemistry of weathering, and demonstrates the role of petrologic characterization in site engineering. Dutrow, Barb, 1997, Better Living Through Minerals X-ray Diffraction of Household Products, in: Brady, J., Mogk, D., and Perkins D. (eds.) Teaching Mineralogy, Mineralogical Society of America, p. 349-359. Hovis, Guy, L., 1997, Determination of Chemical Composition, State of Order, Molar Volume, and Density of a Monoclinic Alkali Feldspar Using X-ray Diffraction, in: Brady, J., Mogk, D., and Perkins D. (eds.) Teaching Mineralogy, Mineralogical Society of America, p. 107-118. Brady, John B., 1997, Making Solid Solutions with Alkali Halides (and Breaking Them) , in: Brady, J., Mogk, D., and Perkins D. (eds.) Teaching Mineralogy, Mineralogical Society of America, p. 91-95. Perkins, Dexter, III, and Sorensen, Paul, Mineral Synthesis and X-ray Diffraction Experiments, in: Brady, J., Mogk, D., and Perkins D. (eds.) Teaching Mineralogy, Mineralogical Society of America, p. 81-90. Hollecher, Kurt, A Long-Term Mineralogy Practical Exam, in: Brady, J., Mogk, D., and Perkins D. (eds.) Teaching Mineralogy, Mineralogical Society of America, p. 43-46.